The grand old man of Kannada words, Professor G Venkatasubbiah turns 100 today – 23 August 2013. Born a century ago, on 23 August 1913, the legendary lexicographer stands a testimony to the history of Kannada and Bangalore. 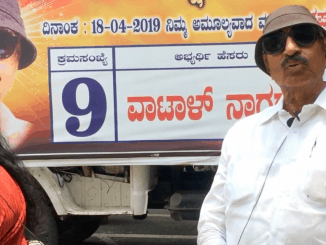 Citizen Matters caught up with Professor GV to get his views about Bangalore and Kannada, their evolution and his long association with them both. Can you explain your association with Bangalore? I came to Bangalore in 1943. Those were very bad days. After the second world war, the economy was in a slump, no jobs were available and people were being retrenched everywhere. My job as a lecturer in Maharaja’s College Mysore ceased to exist, so I came to Bangalore looking for a job. Bangalore was a fine city back then. It was the state capital and all the central offices were here. I felt like I had come to a city from the village. My first job was to teach English in Bangalore High School. Later on when Vijaya College started, I was one of its first lecturers. I taught Kannada in the college for 30 years before retiring as its Principal. From the time I came to Bangalore, I got associated with the Kannada Sahithya Parishat and got involved in the development of Kannada language. In those days there was little Kannada literary activity in the city. The parishat has been instrumental in promoting Kannada. Every year I organised Naada Habba in the Vijaya College, which was a three-day event, with discussions, lectures and theater performances in the evening. Whole Jayanagar used to assemble in the quadrangle of Vijaya college for the event. What changes have you noticed in the city? In the last 30 years, people from all parts of India have come to Bangalore, found its weather so beautiful and its people so hospitable that they have decided to settle down here. So now the population of outsiders is more than the Kannada speakers in the city. Various other languages are spoken in different pockets. When they meet in the marketplace, they all speak in their own languages, only Kannada is not heard in the marketplace in Bangalore. Can the government do anything to change this? There is not much the government can do. What it should do is make Kannada compulsory first language for all students upto Class X. If that is done, then in 10 years all of them will become Kannadigas. If they learn to speak Kannada that is enough. The seniors are not relevant now, its the young people who must learn Kannada. The state must insist that all application forms should be in Kannada. Everything official should be carried out in Kannada so that people are forced to learn the language. In other southern states, this is already happening. It is only in Bangalore most people can get away by knowing Hindi or English. Government should be aware of what is happening to the language. It’s not only about pushing Kannada. Its about finding ways to make people learn Kannada. What are your observations on the development of Bangalore? Ever since the amalgamation of Karnataka in 1956, the city has been growing rapidly in terms of population, buildings and factories, but conveniences for the citizens have kept up. Education is not spreading to the lower classes. Infosys, Wipro and other tech companies have created many jobs and most of the people working there are from outside the state. They are all necessary developments and it means the city develops as well and everybody finds a job. We should not mix language and development. People who come from outside adjust to the city without knowing the language, but they are good citizens of Bangalore. They want to help the city develop and they want greater interaction with other people and they want to make the city their own. Can you describe your work as a lexicographer? My professor A R Krishna Shastry pushed me into it. I have been involved in the preparation of Kannada dictionary from 1956 to 1992. I was its chief editor for 25 years and brought it almost to its completion. Apart from that I have published over 14 other dictionaries. My English to Kannada as well as Kannada to English dictionary are very popular. What are the changes in the language that you observed? Language has changed a lot and it continues to change. Lot of words from other languages have become a part of Kannada. You can’t say pin or pen is not a Kannada word. We have lost the use of lot of words. It’s the duty of the lexicographer to say what word came from where and how the word has developed over the years. In our own language, words transform and sometimes a single word has eight different forms and has evolved over the years. Literary words change into their ordinary convenient form which are easier to pronounce. Sometimes when two words have the same meaning, one of them becomes popular and the other disappears from normal speech, but still can be found in contemporary literature. New technology that enters our lives also brings in new words to the language. Words like switch, telephone and in recent times computer and laptop have become Kannada words. Whenever useful gadgets come into our lives, their names also come along with them and are fully absorbed into the language. Some words get transformed in the villages and re-enter the city in another form. For example, the english word bulb has now become bulbu in Kannada. Names of fruits and vegetables in popular form also become part of the language. The substitution of words from other languages in Kannada will not destroy its chastity. Kannada is a very sturdy language and will absorb and digest these words and make them its own. Every 30 years, at least 10 percent of new words get added to a language. Words change, constructions change and new idioms take charge. New people coming to Bangalore don’t make use of the language so they have not influenced it that much. The language has not changed because of them pronouncing the words wrongly. The locals might make fun of their pronunciation but that pronunciation will not enter language. Some of the words from their languages might enter Kannada. How was your experience as the President of the Kannada Sahithya Sammelan that took place in Bangalore? The Kannada Sahithya Sammelan that took place in Bangalore was an important event in the city. Writers and poets from all parts of the state participated in it. It was an occasion for people in the city to see the best of Kannada. I was the president of the Sammelan. They took me in a procession as if it were a Dasara procession. I didn’t feel happy about it and I was not comfortable. It is alright for film stars but not for a literary man like me. I have liked the city ever since I moved here. There is a life in the city which you will not find anywhere else. The city is alive and the people here are very aware of everything that is happening around the world. The cosmopolitan nature of the city makes it attractive and I’m sure that this cosmopolitan quality will continue to survive and will not come in the way of the development of Kannada. Do you see hope for the language? There is a new wave of brilliant young people who are interested in the vedas and also in their culture. There is change over in their attitudes and they see the western culture as a regression. Along with this, they have a pride in their own language. The Kannada movement will continue be strong and Kannada will grow, thrive and develop. The quality of the literary output in Kannada is very high. Many and apart from it their many literary events in the city. For example, there are plays being performed everyday in theaters such as Ranga Shankara. Have you seen interest among people to learn the language? Books have been written for people wanting to learn Kannada through other languages, but people don’t make use of them. Only some factories have kannada classes for their employees, but that’s a small number, it will not make any big difference. If people from coming from other states learn Kannada, they and the language will benefit from it. I am not for imposing Kannada at the expense of other languages. Every state has a local language and everyone who moves from one state to another should learn the local language. For example, If someone moves to Bengal they should learn Bengali. That way they will be helpful in the development of the local language. This will also ensure a greater interaction among people and kind of friendship would develop among the citizens. Prof. G Venkatasubbiah is Kannada’s foremost lexicographer who, even at the age of 100, is active in the literary field. After completion of his MA in Kannada and BT degree from Mysore University, he engaged himself in teaching and literary research. An expert speaker at literary seminars, he is one of the few lexicographers who can speak with authority on words and their meaning including the origin and development of every word. His weekly column on explanation of connotative and denotative meanings of words, ‘IGO KANNADA’ (meaning ‘This is Kannada’) in Karnataka’s most popular daily Prajavani ran for more than 18 years. Three volumes of ‘IGO KANNADA, a Socio-linguistic dictionary’ have since then been published and reprinted several times. He was involved as chief editor – for nearly 20 years, in the preparation of an authoritative, monolingual Kannada dictionary in line with Oxford University English Dictionary. He brought this to near completion during his tenure. Now this mammoth work of 8 volumes and 9000 pages is completed. He has also authored more than 30 independent works, edited many Kannada texts and translated a few English books. Total publication to his credit till date is nearly 140. He was conferred with many awards, including Rajyotsava Award and ‘Karnataka Ekikarna Suvarna Puraskar’ from Government of Karnataka, Karnataka Sahitya Academy Award, Karnataka Press Academy Special Award etc. He has been conferred with ‘Nadoja’ honorary degree from Kannada Vishvavidyalaya, Hampi. He also presided over the 77th All India Kannada Sahitya Sammelana held in February 2011. He is also the President of ‘Sri Ramakrishna Students Home’ a 90-year-old free hostel at Bangalore which provides accommodation for nearly 50 boys. Information courtesy: Arun G V.
Nandini Alva, all of 52, sounds very articulate when we speak to her about her entry into politics. 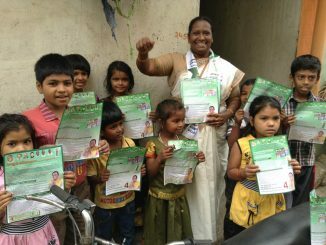 Get to know this JD(S) candidate from Bangalore Central better! When asked why JD(S), she says INC and BJP are more corrupt than JD(S). Read what Ruth Manorama has to say. ther is no harm in learning a new language (“Kannada”). It wont cost you anything. Believe me it simpler than other south indian languages due to many hindi and sanskrit words.